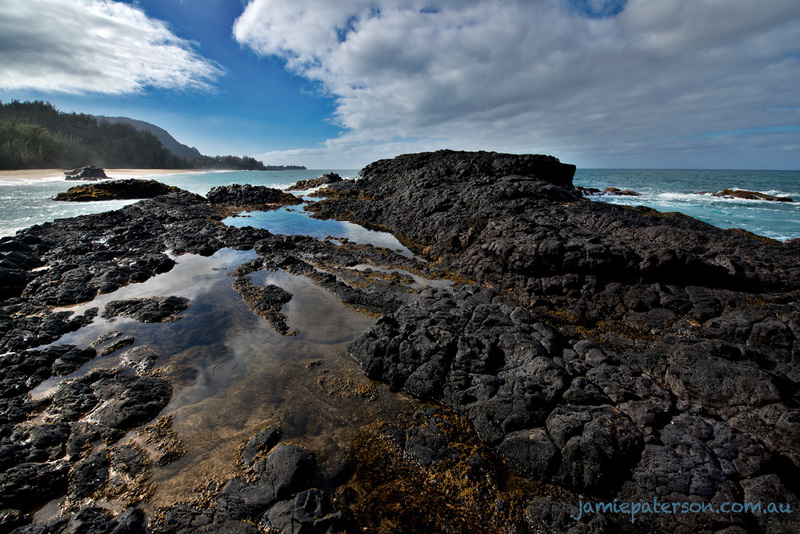 Queen’s bath in Kauai is a visually spectacular place on the island and definitely worth a visit. Its extremely popular because of the views that you get from the Queen’s Bath across Hanalei Bay, but also because its a really nice place to swim as well. Each time I head across to Kauai, I’ll always head down here to have a swim and chill out by the ocean. It looks calm and inviting here but its typically closed during the winter months, as the path itself is long and very slippery because of all the mud and the huge Hawaiian swells come roaring straight over the baths. If you think its worth the risk heading down here in Winter, there is a sobering sign at the bottom of the path listing the names of those who have drowned in this location. 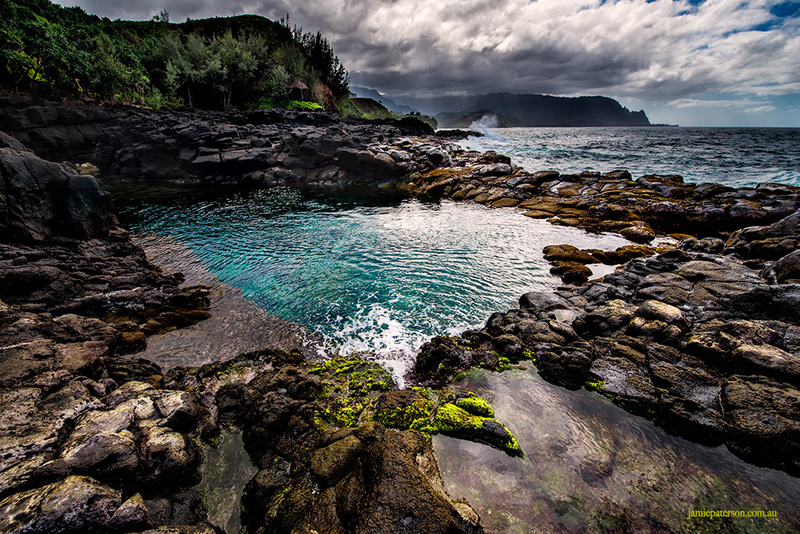 On the bright side, in summer this place is probably the best spot to go swimming in Kauai. In this amazing world I have two spiritual homes. One is here in Western Australia, at Injidup Beach down near Yallingup and the other is Lumahai Beach in Kaui and I just love to photograph both of them. They’re both very similar, very uncrowded wide open to ocean swells and to me they contain an element of spiritual healing. Both of them totally inspire me to concentrate on my seascape photography. I can sit down at either one of these beaches and instantly my cares fade away and its just me and the ocean. In fact I have spent hours at both beaches just relaxing without even picking up the camera, which I think is important. The more time you can spend at a place and learn about its character and quirks the better photos you’ll manage to capture of it. We should all have a place that inspires us and moves us, one that when we have a photographers block it reignites our passion for our art. One that we can easily close our eyes and see ourselves there, and feel the sand squishing between our toes, while the wind gently touches our face. If you learn about a places moods then its so much easier to notice all the finer details of the place that others will miss and you’ll start to capture photos of it, that others just don’t see. So where is your favourite place to shoot? One that totally inspires you when other places don’t? One that is like visiting an age old friend who always brings a smile to your face. Let me know! 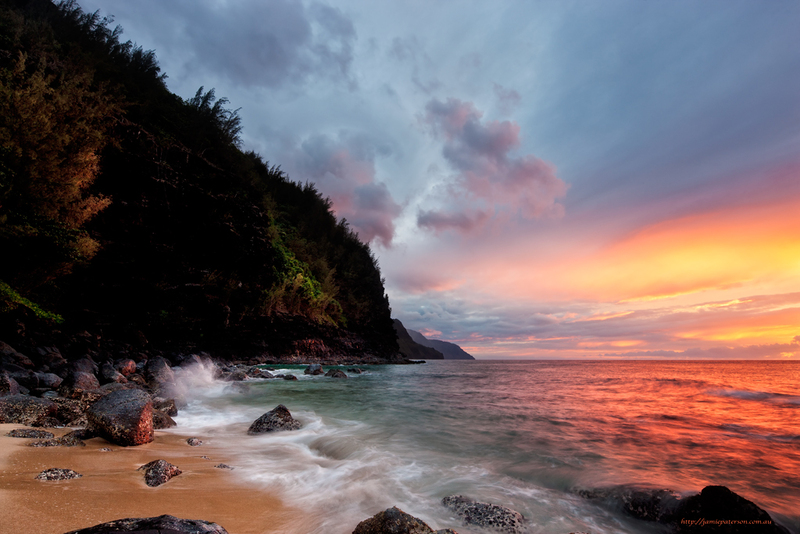 I was in Kauai and had just finished shooting the sunset at the Na Pali coastline. The breeze was blowing softly with a slight misty rain falling upon my face. It was a beautiful feeling and it was my second last night in Hawaii. I just didn’t think things could get any better. 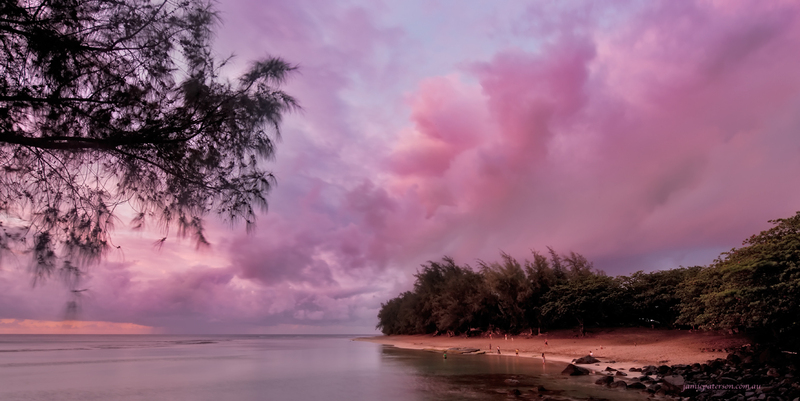 After walking around the corner back to Ke’e Beach the sky lit up again with this stunning afterglow. Simply incredible! Its good to be alive and experience these things. Hideaways Beach in Kauai is incredibly hard to find but once you find it you just know it was worth the effort. Its not so much that its in a secret difficult spot, its that most of the public access to the beach is restricted. Its one of the things I really disliked about Kauai and it makes me realise how lucky we are in Australia to have almost free access to our entire coastline. The only available public carpark has a spot for 10 cars, that’s it! Needless to say I had to be creative with my parking endeavours and ended up sneaking into one of the private resorts and parking there. Any way once I made it to Hideaways Beach I had a blast. I got there 2hrs before sunset as I’d never been there before and I wanted to have a good look around. Whilst I was there I saw this awesome rain shower drift over the mountains and that it was being illuminated by the last rays of daylight so I started to snap away. Lumahai Beach just screams Hawaii to me and it was a must do photography location for me. It must scream Hawaii to others as well as it was where a large part of South Pacific was filmed in 1958. The colour of the water is stunning and its surrounding by beautiful green mountains. Despite its tranquil looks in this photo its actually a very dangerous beach and has been nicknamed Lumadie by the locals. Lumahai Beach is normally exposed to really large surf and swell and has really strong rips swirling around it. I’m pretty stoked the way this photo has turned out. It was my last day in Kauai and it had been raining all day, I really didn’t think I was going to capture anything at all. In fact I seriously contemplated staying at home as it was raining that hard. 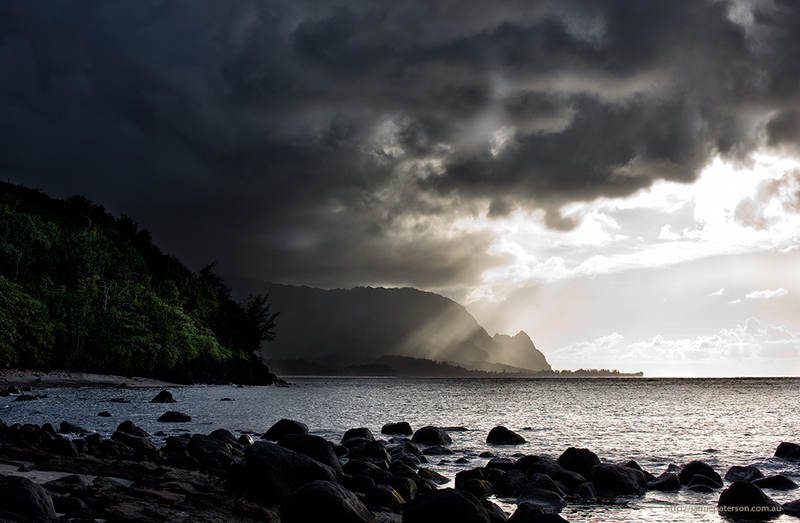 Well as per usual Kauai turned it on just in time and this amazing scene unfolded before me. Talk about being rewarded for turning up! I hope you guys enjoy looking at it as much as I enjoyed taking it. Out of all the photos I’ve taken of the Na Pali coastline this would have to be my absolute favourite. Such a magical time in such a magical place! This was taken from Ke’e Beach and I’m really grateful to the hiker who suggested that I walk around the corner an extra 200M as he thought it might be a better view. He was so right! I’ve said it before and its just so easy doing landscape photography in Kauai the place is just one giant canvas, full of amazing colours and vistas. After almost 12mths in the planning I was finally able to stop off at Kauai, Hawaii on my annual visit to Houston and its something I’ll never forget. 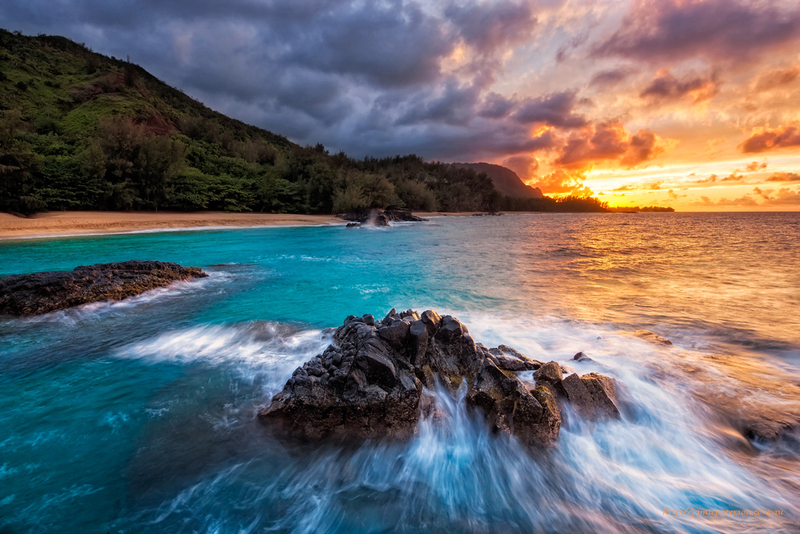 Kauai has to be one of the most beautiful places on earth. Each day I found myself waking up before sunrise of course and wondering what visual delights would unfold before me that day. I was never disappointed with what I saw at all. The funniest thing about Kauai for me was all the chickens but that is another story for another time. On this particular day I caught up with Kauai photographer Scott Tylor and we managed to get to some awesome out of the way places and also managed to meet the ‘Duke’ some whacked out guy who kept telling us he was the island’s best surfer. 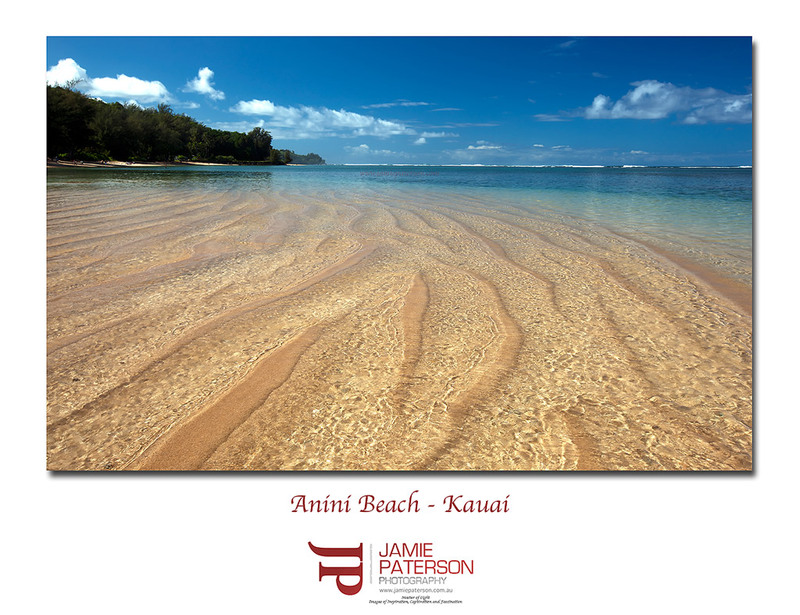 This beach is called Anini Beach and people like Julia Roberts and Slyvester Stallone own homes here and for good reason. Its stunning. Definitely a place I’d love to take the family back to so that the boys can play and splash in the shallows. We were just about to leave Anini Beach when we spotted these really cool patterns in the water, we quickly unpacked our cameras and started shooting them for the next 30mins. Talk about heaps of fun! What do you guys think of the patterns? Just a small hint as to where I’ve been for the past couple of weeks. 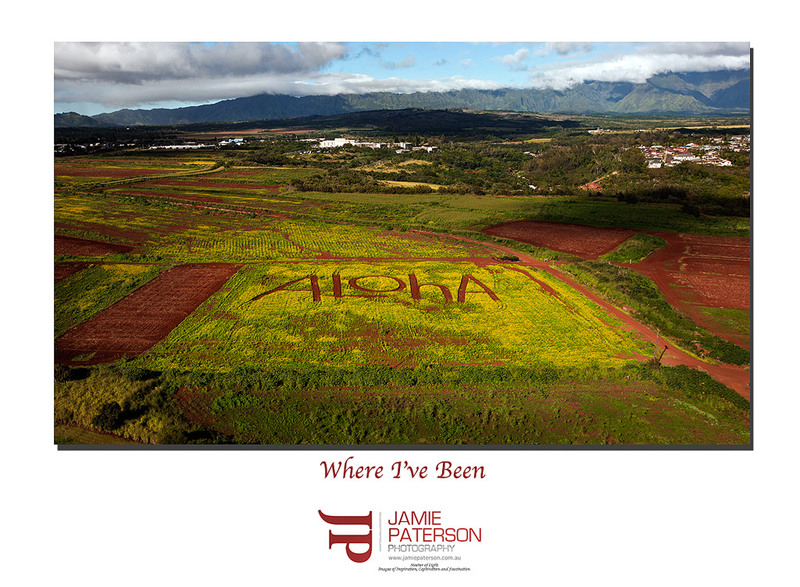 I was luck enough to be able to get to sunny Hawaii for six days and then Houston, Texas. Normally each year I spend a few days on Oahu, but seven months ago I decided to head to Kauai instead in this year and I must admit, I could never go back and stay on Oahu again, unless the surf is huge of course. I stayed out on the North Shore of Kauai and had such an amazing time, drinking beer, listening to reggae and of course shooting as much as possible. I could easily spend the rest of my days there! This photo was a quick shot that I managed to fire off as we were landing in a helicopter after doing an aerial tour of the Na Pali coastline, which is another story. Stay tuned for more soon now that I’m back!